These are our friends, Emily and Steve, who just got married on June 12. Beautiful bride, handsome groom, fun couple, lovely wedding = perfect day! You may remember them from an earlier post when Grant and Kristen brought them down to Prairie Wood for a visit and they all made homemade pizza dough and pizzas in the brick oven. Kristen and Emily can roll out the most perfectly thin pizza dough I've ever seen, for the quintessential thin-and-crispy crust. The-thinnest-ever! We love thin and crispy pizza in our little corner of wonderful world of pizza, where every pizza is a good pizza -- some are just perfect! Grant and Kristen also made a batch of Buffalo Chicken Wing Dip, which lead to Buffalo Chicken Wing Dip Pizza that we all loved -- especially Steve, who declared it the best pizza of the evening. All four of them like getting together and cooking and eating and drinking a little wine and some of St. Louis' finest beer. I just love that! Kids who take time to cook and enjoy the best part of real food -- sharing it with good friends. I can't wait to see what they try next, now that Kristen is finished with her BSN night classes and Emily has her own kitchen and her own Kitchen-Aid mixer. 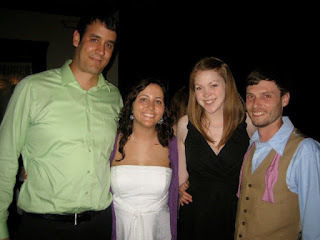 This is the four of them together for a picture at the rehearsal dinner. And yes, that would be Grant with a bow tie hanging around his neck -- a pink bow tie at that. No-fear fashion for my boy! I wanted to post Emily's recipe for the classic party favorite -- Tortilla Roll-Ups -- because they are, without a doubt, the best I've ever tasted. She made them for Kristen's graduation last month and I had to have the recipe. It turned out though, that the critical ingredient making these roll-ups so special was difficult to find around here. But since I make it a point to visit grocery stores when I travel to other places, I managed to find it last week in Cape Girardeau. Made the whole trip for Dean to see the oral surgeon worth it for me, just to find Hidden Valley Fiesta Ranch Dip Mix! Gotta love it when there's an up side to visiting the oral surgeon. Although I'm not sure Dean was excited about the dentist or the dip mix. So here's the recipe and trust me, the Hidden Valley makes the difference, and makes these Tortilla Roll-ups the best of the fast and easy appetizer genre. Make them, if you can find the dip mix. They're cool and refreshing which is just what I want for summer parties. I'm thinking those green and red tortillas were another reason they were so good too. Just look what they did for Emily's presentation. I usually use about a spatula full of the mixture for each tortilla. Spread it over the whole tortilla and roll it up. Slice the rolled tortilla into ½ to ¾ inch slices and serve. These are great to make the day before, just keep them in an airtight container or ziploc, remove and cut when ready to serve! This vibrant coleslaw was inspired by leftover shredded cabbage and more chopped green onions from the Taco Salad Bar the other night. A night or two later, I decided coleslaw would be good with the salmon patties I was planning. And I was so right! The flavor match was perfect -- fresh, bright, crunchy and fruity played nicely with the rich salmon. And what a lovely feast for the eyes too! I'll be making this all summer long, with variations on a theme. Like lemon or lime juice -- pineapple, mango or tart apple -- and other varieties of cabbage, as they become available at the farmers' market -- although that red cabbage can't be beat for its dramatic punch of color, don't you think? What the heck -- how about a little extra crunch with almonds, pecans, chow mein or rice noodles? Just let you imagination run wild through your vegetable drawer. But let's be careful out there. While technically a leftover, unidentifiable vegetable slime falls way beyond the scope of leftovers for coleslaw -- or just about anything else. Except maybe a prize-winning science experiment, but school is out, so forget about that. Vintage is not an endearing quality in a vegetable. And it's not at all trendy like, say, heirloom vegetables. In fact, I don't want to be a snob or anything, but if you don't know the difference between "heirloom" and "vintage" as it applies to vegetables, please stick to the ready-made coleslaw from the deli counter. But please keep reading food blogs, even if it's just for the valuable service provided for healthy eating! Note: These measurements are all approximate - please adjust for your taste and what you have on hand. In a large bowl, toss together the red cabbage, green onions, mandarin oranges and carrots. In a small bowl or jar, blend dressing ingredients and shake in a jar or whisk to blend thoroughly. Pour dressing over salad and toss to coat evenly. Cover bowl and refrigerate coleslaw for several hours before serving. Another Note: This would be great on fish tacos! The calendar may not say it's officially summer yet, but here in Southern Illinois it's already hotter than fire, steamier than a sauna and I all want to eat is something light and easy, with gallons of iced tea. This Pesto Chicken Salad was born from that desire, along with bits and pieces of leftovers from a Sonoma Goat Cheese Torte party appetizer and a Taco Salad Bar for my birthday club dinner last week. When it's too hot to cook, I just love to take my inspiration from leftovers and create something -- no cooking required. And it's a big bonus when my frugal creations become even more satisfying than the original dishes were -- which is just how this chicken salad turned out! So simple, but oh so good! I was a little chop happy though, and ended up with more green onion and red pepper than I needed to enhance this leftover dish, so I now have more bits and pieces to play it forward for another easy no-cook meal for tomorrow. Are you following this? Yesterday's leftovers, today's dinner, tomorrow's inspiration. And still no hot kitchen! I'll meet you back here tomorrow to see what becomes of leftover leftovers. What do you do to beat the summer heat, but still have something good to eat? I like to prepare several oven-roasted chicken breasts, sprinkled with Lawry's Seasoned Salt and keep them in the fridge (or freezer) to slice or chop for salads or sandwiches. Preheat oven to 350 degrees. Place chicken breast on foil-covered baking sheet and bake until just cooked. Remove from oven, cook and place into a ziploc back or covered container until ready to use. Slice cooled chicken breast and then chop for chicken salad. Add chopped red pepper and green onions (and any optional ingredients - which may require more mayo and pesto.) Mix mayonnaise and pesto and add to chicken mixture. Stir to blend completely and season with salt and pepper to taste. Chill in refrigerator until serving. Use for sandwiches, serve with crackers or place a scoop on a bed of salad greens. 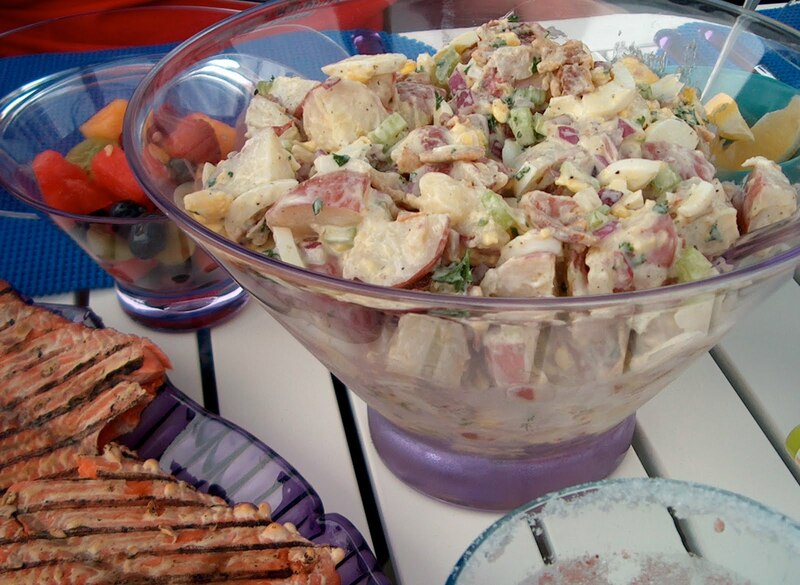 A good potato salad is a wonderful thing! It is cool comfort for lunch on lazy summer days -- cold chunky potatoes, studded with crunchy bits and bathed in a silky dressing . . .
And the quintessential picnic food -- good with sandwiches, hamburgers, chicken, pork tenderloin, steaks, salmon and . . .
You know though, I've discovered potato salad is a perfect breakfast food for summer days here in the Heartland -- where the temperature never dips low enough at night to offer any relief from more suffocating heat and humidity the next morning, and the only breezes are strong winds that come under cover of darkness accompanied by lightning and thunder. Well, most of the time anyway. So this is my idea for some cool fuel for those steamy mornings -- potato salad for breakfast! This recipe was introduced to me by our neighbors at a unseasonably delightful June dinner party on their deck a couple of years ago. They were just back from Alaska and kind enough to share some of their beautiful salmon you see on the platter there . . . and this potato salad Dan found on the food channel. I've adapted the recipe a little. I prefer my raw onions to be green and, if a little bacon is good, more bacon is better. Of course! Even if you already make the world's best potato salad (and I need your recipe, if you do!) summer is long enough -- and hot enough! -- to add another to your repertoire. You can think of this recipe as bacon and eggs, with a side of potatoes, all slathered in a creamy gravy. A perfectly lovely combination of bacon, eggs and chunky potatoes -- you'll have to remind yourself, it's not just for breakfast! Place the potatoes in a medium saucepan and add enough water to cover by 1-inch. Bring potatoes to a boil over high heat and cook until just tender, about 15 – 20 minutes. Drain, cool and then cut the potatoes into halves or quarters, depending on the size. Season with salt and pepper. In a large mixing bowl, combine potatoes with all remaining ingredients and gently toss to blend. Refrigerate finished salad for several hours before serving, to allow flavors to blend. The last few weeks of May have been important ones for my family. My niece and all-around good kid, Megan, graduated from middle school with an armload of awards and honors. My nephew, Andrew, graduated from high school and is now carefully weighing his options for college first, or Air Force then college. And my bright and beautiful daughter-in-law, Kristen – who began working as a nurse as soon as she earned her LPN, and then worked while she finished her Associates Degree, then passed her RN boards, and then went on to work full time as an RN while she completed her 4-year degree – has just received her B.S.N. from Webster University. All three of these kids are at different stages in their educations and careers, but they have one thing in common – they have worked hard to reach a goal. They have solved problems, jumped hurdles and challenged themselves to achieve something that wasn’t always easy for them. And isn’t that the greatest and most rewarding lesson any of us can learn – on bad days and good days, long days and short days, sad days and happy days – just keep working toward your goals. Megan’s graduation from middle school reminded me of the one and only award I received on honor’s day at Lincoln Junior High School. I had been a good student all through seventh and eighth grade, so I expected to, and did, graduate with honors. I was completely unaware there were other awards to be given though. When I heard my name called, I was a little surprised. As I stood and walked toward the podium, a thousand thoughts began to race through my head. What did they say? There must be some mistake! The Future Homemaker Award? It’s like I’m some sort of junior June Cleaver. I’m a marked woman! Everyone will think I’m earnestly searching for Mr. Future Breadwinner of the Year! I can’t do this. This can’t be happening to me! Smile. Take the little box. Shake hands. Slink back to my seat on the bleachers. It’s all over now. My life is over. Seriously! Isn’t it funny how self-absorbed we can be at that age, thinking that anyone even took notice of my little award! Nevertheless, that whole dialogue played out in my mind in a matter of seconds and the memory is vivid to this day. Until now, I’ve always regarded that little pin, still tucked inside its little plastic box, with mixed emotions. I never took another Home Ec class after eighth grade, and with good reason! Those skills were free and easy enough to come by at home, especially in a family with six kids. Cooking, cleaning, laundry, sewing, home decorating and caring for babies, toddlers and teens were inescapable facts of life for me – the oldest child and only girl in my family. I had done all the homework I needed on that subject! I preferred to think I should set my course for bigger things. For me, that meant working hard in high school, making good grades, earning a scholarship to college, and working two jobs for four years. That B.S. degree was the means to an end. Education = career job + travel + adventure + independence. That’s what I wanted! So what did I do after finishing my degree in English? I married the guy who caught my eye at work one day. It was right at the beginning of my senior year and he was a man in an Air Force uniform. 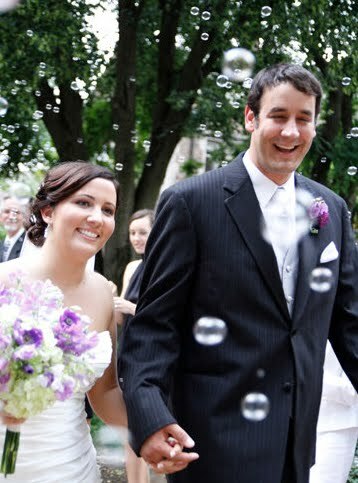 Ten months later, just two weeks after I graduated from college, we got married, moved away from my home and family, traveled and had adventures. Not exactly the way I had planned, but plans can change when a better plan comes along. Throughout our travels, my formal education and college work experience opened many doors. I had credentials, as well as the confidence and creativity to adapt to whatever work situation I found. My career was not quite what I had planned either – sales clerk, office worker, substitute teacher, hospital volunteer, testing program specialist, college program director, college administrator, paralegal, school board member and college counselor. I never worked as a writer, an editor or an English teacher. But I was never bored and there was always something new and interesting to learn. If you know anything about the Air Force, you won’t be surprised to learn that we moved nine times in the first eleven years we were married! And here’s what happens when you move? You have to take your home apart, piece-by-piece and pray that it arrives safely and in a timely manner. Then you reassemble it, as fast as you can, in a totally different environment, before it’s time for the next move. So while my pilot was flying off to places around the world, known and unknown, friendly and hostile, I was the busy homemaker – cooking, cleaning, sewing, and decorating our living quarters so that it was cozy, comfortable and always welcoming for all who entered. I never knew who or what to expect, but there was never a dull moment! It wasn’t long before I realized that, no matter what work I chose to do outside the home, I was born to be the homemaker. I’d been fluffing pillows and feathering my nest since the day I realized I owned my half of the bedroom I shared with my brother. Early on, I had taken my first serious step into the kitchen to make tuna fish the way I wanted it – without pickle relish! And I had discovered sewing was just like a puzzle that becomes five new outfits for the same price as one from the store. I also realized that way back in the eighth grade, when I was awarded that Future Homemaker pin, I was already cooking, sewing and decorating well beyond my years. And in the years since then I’ve certainly relied on all of those skills and talents to help me along the pathways of my life, both chosen and not chosen. I’m happy with how things have worked out for this Future Homemaker. I am also happy that Megan and Kristen are so serious about doing well in school and choosing careers. But I am just as pleased that both of them are interested in cooking, sewing and decorating. It never hurts to be able to do it all, just in case you decide someday that you want it all – meaningful career, healthy family and happy home. This month, our series on healthy eating continues with some more recipes using fruit. I’m sure a lot of you already consume plenty of fresh or frozen fruit every day. However, I’ve never been a big fruit eater, so I’ve been making a sincere effort to add more fruits to meals at our house. Locally grown fruits in Southern Illinois – blackberries, blueberries, raspberries, strawberries, cherries and peaches – are valuable sources of anti-oxidants, vitamins and other nutrients. Eaten out of hand, they are delicious and refreshing. But added to vegetables and spices, they become something extra special. Chop and blend them into salsas, chutneys, relishes and sauces to serve with grilled meats, fish and poultry for a light main dish. But wait, there’s more! Pour these chutneys and salsas over a block of cream cheese or goat cheese and serve with crackers for an easy, light and delicious appetizer. Enjoy the fruits of summer! Blackberry peak season is May to September. A one-cup serving has about 62 calories, 8 grams of fiber and 50% of the RDA of Vitamin C.
In a large frying pan, sauté the onion and garlic in olive oil over low heat. Add the salt, vinegar, sugar and spices, blending well. Add the fruits and nuts. Continue cooking over low heat for 12-15 minutes, until the fruit is lightly cooked. Let cool. Cover and refrigerate for several hours before serving. Stored in refrigerator, it will keep for a couple of weeks. Serve with grilled chicken, pork or salmon. Blueberries are harvested from May through August. A one-cup serving has about 84 calories, 4 grams of fiber and 24% of the RDA for Vitamin C.
Combine sugar, vinegar and ginger in a medium saucepan; bring to a boil over medium high heat. Boil for 1 minute; remove from heat and let cool. Combine fruits in a large bowl. Pour sugar mixture over fruit and let stand for 30 minutes. Serve immediately or transfer to an airtight container and refrigerate up to 1 week. In a large bowl, combine the berries, sugar, onion, lemon juice, pepper and hot pepper sauce. Cover and refrigerate for 1 hour. Stir in almonds just before serving. Raspberries are very delicate and are harvested from June through October. A one-cup serving has about 64 calories, 8 grams of fiber and 54% of the RDA of Vitamin C.
In a blender or food processor, combine all the ingredients and puree until smooth. Pass the puree through a fine-mesh sieve placed over a bowl, pressing firmly on the solids with a rubber spatula or the back of a wooden spoon to extract all the juice. Scrape the inside of the sieve periodically to dislodge any seeds that may be plugging the holes. Keep pushing the pulp firmly through the sieve until all that is left is a small number of seeds. Cover the puree and refrigerate until ready to use. Makes about 1 cup. Serve with grilled fish or chicken. Place garlic on a double thickness of heavy-duty foil; drizzle with oil. Wrap foil around garlic. Bake at 425 degrees for 15-20 minutes. Cool for 10-15 minutes. Place softened garlic in a small saucepan. Add the remaining ingredients. Cook over medium-low heat for 15-20 minutes until sauce is thickened and bubbly. Remove from the heat; cool slightly. Transfer to a food processor or blender; cover and process until smooth. Strain seeds through a fine-mesh sieve. Store in the refrigerator. Baste sauce on grilled chicken or pork during last few minutes of cooking. Serve additional sauce on the side. Strawberries are harvested April through July. A one-cup serving of strawberries has 49 calories, 3 grams of fiber and 149% of the RDA of Vitamin C.
In a saucepan, combine the first six ingredients; bring to a boil. Reduce heat to medium; cook, uncovered, for 15 minutes or until slightly thickened, stirring occasionally. Stir in strawberries. Reduce heat to low; simmer 10 minutes longer or until thickened, stirring occasionally. Refrigerate overnight before serving. Stir strawberries, scallions, cilantro, lime juice and jalapeno (if using) together in a small mixing bowl, and season to taste with salt and pepper. Serve with grilled or pan-seared salmon. Cherries are divided into two varieties: tart cherries used mainly for pie filling from Michigan, and sweet cherries from the northwest states for eating out of hand. A one-cup serving of sweet cherries has about 87 calories, 3 grams of fiber and 16% of the RDA for Vitamin C.
Combine cherries, orange juice, sugar, orange peel, mustard, salt and bitters. Cover and simmer gently 5 minutes. Combine water and cornstarch; stir into cherry mixture. Cook and stir until thickened and clear. Sauce may be stored up to a week in the refrigerator. Serve with grilled chicken, ham or sausages. Combine all ingredients in a medium bowl. Refrigerate at least 2 hours before serving. Makes a summery relish for grilled meat or poultry, especially duck. Peaches are divided into to varieties, clingstones and freestones. Fresh peaches are available from late May into August. One large peach has about 68 calories, 3 grams of fiber and 19% of the RDA for Vitamin C.
In a bowl, combine all ingredients and stir to blend. Cover and refrigerate for at least an hour. Serve with grilled chicken or fish. Cut up 3 of the peaches. In a blender or food processor, combine the cut-up fruit, lemon juice, honey, and black pepper; cover and blend until smooth. Transfer mixture to a small saucepan, and simmer, uncovered, about 15 minutes or until slightly thickened, stirring occasionally. Chop remaining peach and stir into sauce with thyme. Sauce may be made up to 24 hours in advance. Reheat over low heat, stirring occasionally. Serve with pork or chicken.